These nocturnal critters are found throughout the country, especially near water. Their diet consists mostly of small animals and insects. They are mild-mannered creatures and will only shoot their notorious spray when threatened. Skunks only occasionally bother the garden, perhaps feeding on corn that's close to the ground. Mostly, their damage is due to nighttime digging in lawns and flower beds as they look for one of their favorite foods: grubs. 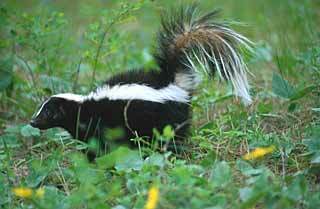 Skunks may dig many 3- to 4-inch-deep holes and make a lawn look like a war-zone in one night. The two best ways to rid yourself of skunks are to eliminate their food source or trap them. Spray beneficial nematodes or milky spore disease on lawns and flower beds in spring to reduce the grub population. You can also place ammonia-soaked rags in the skunk's den area (usually in an old woodchuck hole or under an outbuilding) to ward it off. If you have a problem skunk under a porch, woodpile, or stone wall, it's best to trap and relocate it.